sidered organizing a congregation. In the fall of 1906 our first pastor, Rev. S.D. Vangstad arrived and on December 4, 1906 a meeting was held. Here plans were made, and on January 17, 1907 a congregation was formed and the name Immanuel Lutheran was chosen. As the pastor was living in a rented house, which was also used for church services, our first need was to provide a home for our pastor and his family. Hence in March, 1907 it was decided to build a parsonage which would also furnish room for our church services for a time. A building site was then required and several locations were offered. From these, a site donated by Iver Hanson Sr. was chosen and work on the parsonage was soon under way. Some assistance in building material was donated by our sister church, the Bethel Congregation at Erickson. Our members gave freely of their time and financial support. Ladies Aid had been organized in 1905 and Sunday School in 1908. In 1912 it was decided to build a church. Work was carried on very well and our church was in use by 1914. It was not however completed until 1917 when it was dedicated. Rev. Edward Hage from Saskatchewan of­ ficiating at the dedication service. In later years the majority of members decided that the village of Clanwilliam was a better location for the church than its original site. 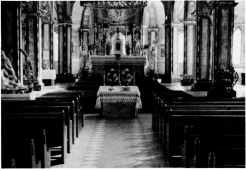 Hence it was decided to move the church into the village and work was begun on the change December, 1950, and completed in January 1951. The parsonage had been sold earlier as the congregation at Erickson had built a parsonage to provide a home for our ministers, they being the larger congregation now. In July, 1947, we celebrated our 40th Anniversary and were thankful that so many of our former Pastors could be present with us as well as former members. In July, 1967 we celebrated the 60th and last year, 1982, June 27th, celebrated our 75th. Many blessings have been ours during these years for which we thank God. We are especially thankful for the men and women He has sent us to be our spiritual leaders and advisors. We remember them with love and gratitude. At the turn of the century an influx of Ukrainian settlers came to the Mountain Road area, one of the most isolated areas in Manitoba. A place of worship was needed and a small log church was erected in 1904. Persons doing the organizing were Matt Baraniuk, Joe Zadonick, Actenia Todoryk, Mike Baraniuk, Matt Paswisty and John Soroka. 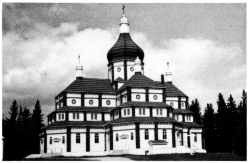 Then in the 1920's the farmers harnessed a dream of building a large wooden cathedral for a place of worship and as a center for their village, hoping the cathedral would act as a stimulus to a building boom. St. Mary's Ukrainian Greek Catholic Church, Mountain Road. contacted as he was building a similar cathedral there, and he agreed to build the same here. Each winter far­ mers went to the nearby Riding Mountain National Park and swamped thousands of board feet of logs for lumber, while in the fall contributing heavily to the funds for the building from their crops. With the arrival of Father Ruh in 1923 the work began on the building, and every person in the area gave fifty hours free labour as well as raising cattle for auction. There was only one hired carpenter. 'With sweat on brow, strength in hand and faith in mind, the cathedral was completed in 1925 at the cost of $18,000.00. The low cost was made possible by availability of free lumber and voluntary labor. The cathedral built on a slight rise towering above the native spruce could be seen for miles around. St. Mary's Ukrainian Greek Catholic Church, Mountain Road alter.